Jewel Case housed in a card slipcover. Released 2013-05-31 in mainland Europe, 2013-06-03 in UK. Track 7 mixed at JHOC in Pasadena, CA. 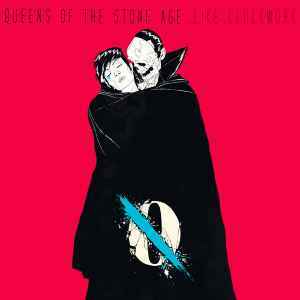 ℗ and © 2012-2013 Queens Of The Stone Age. Under license to Matador Records. Wow, that was heavy. Thank the gods it's over. Their worst album by miles. It's one hell of a task to get through the whole album without falling asleep, even when someone pops it in the car stereo for me while I'm driving. Now that's dangerous. It's so flat, non-dynamic, and totally unhappening I find it hard to believe that this is the same band that did Lullabies To Paralyze. Not that that one was a flawless masterpiece, but definitely a few cuts above in terms of adventurous songwriting. At least there aren't two consecutive songs on Lullabies that move at the same speed, keeping the rollercoaster vibe alive throughout it. Every song on this record is so anti-climatic, listening to track after track just looking at the led lights on my amplifier is the equivalent of watching a caterpillar with a limp drag along for an hour. This might just be where I drop them. Honestly, TOP record, a bit different sounding, but their best in my opinion. The songs are better crafted, musically and sonically richer and more diverse than in any of their previous releases. I pick up some "Heathen" and "Reality" era Bowie influences, not sure if it's premeditated or not, but it works for me. Great piece of work! My hat off to the gents. My standard 150-gram 2x12" black release sounds totally fine, pressing-wise. No surface noise, no pops what-so-ever. Maybe the mastering is a bit of an issue, as this seems to be another victim of the loudness war (but what else do you expect from hard rock these days? ), but the pressing itself is fine. My one complaint with QOTSA vinyl releases is price.